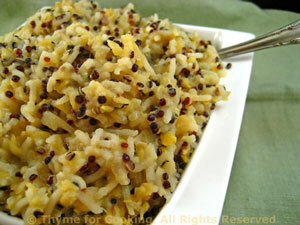 Quinoa, Basmati Rice and Red Lentil Pilaf, Thyme for Cooking healthy sides. Quinoa, Basmati rice and red lentils all cook in about the same amount of time, making this an easy and healthy side dish. I used black quinoa for color contrast - red or white will work equally well. Roughly chop onion and sauté in oil in a medium saucepan. When tender, add all remaining ingredients, cover and simmer until done and all stock is absorbed. Check when almost done and add more stock if needed.